Unofficial details about the 2019 flagship Android smartphone of Korean Giant Samsung Mobile are now starting to surface online. Already being called Samsung Galaxy S10, based on the familiar product nomenclature of the company, this upcoming smartphone is expected to be formally unveiled at Mobile World Congress 2019, which will be held in Barcelona, Spain within the last week of February next year. As the follow-up to the powerful Samsung Galaxy S9 from 2018, the rumored Galaxy S10 will surely be the best and most feature-packed handset that the Korean handset maker has ever crafted. Based on everything I've read so far, it seems that the Samsung Galaxy S10 will have five things that are particularly special about it. 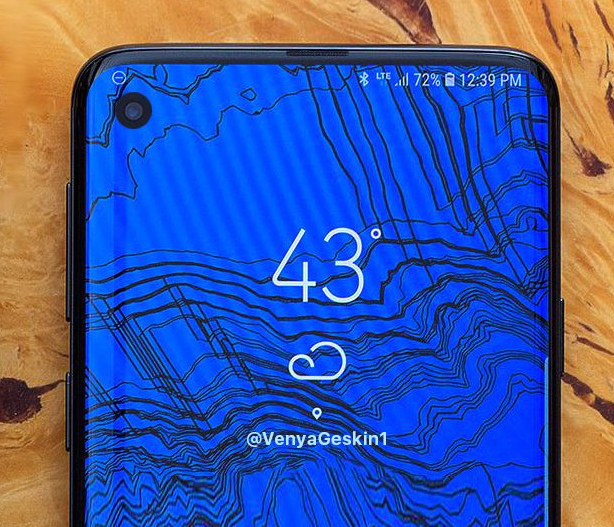 Based on these concept images made and posted by TheVerge, it's clear that the 2019 top-of-the-line model will have an Infinity Display with a rather unique Front-Facing camera placement, which is the first thing that's supposedly unique about it. Samsung has never been fond of the notch. In fact, the company has even made fun of the notches of the iPhone XS and Google Pixel 3 Android smartphones through their ads. Hence, it doesn't come as a surprise that these S10 renders don't show such display feature. As you can see in these images, instead of having a notch to house S10's selfie shooter, the phone has what looks like a mole or a 'punch hole' in the upper left part of its all-screen face, which houses the front cam. According to insiders, Samsung calls this the "Infinity-O" screen type. Aside from that, they said that Samsung Galaxy S10 will come in two sizes; One having a 5.8-inch Infinity O SuperAMOLED QuadHD+ Display and the other, which will most likely be called Samsung Galaxy S10+, donning a 6.4-inch panel. The second thing that's said to be special about the Galaxy S10 is its purported Ultra-Sonic In-Display Fingeprint Scanner, which should work a lot like the ones we see on some high-end OPPO and Vivo Android smartphones. This feature allows the user to quickly and conveniently unlock the interface simply by touching a small portion of the device's screen with his or her registered finger. 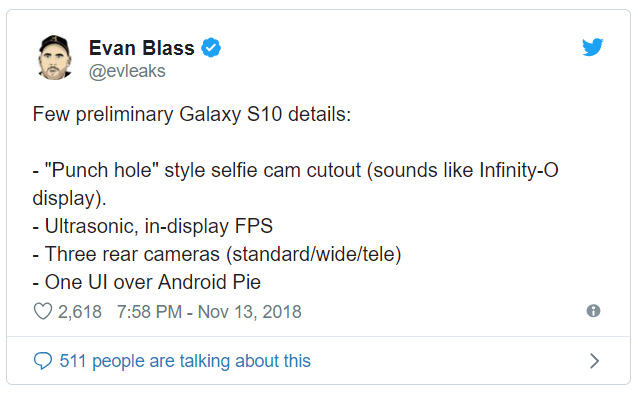 Third, according to serial gadget leaker Evan Blass, the Galaxy S10 will have a Triple Rear Camera module with functionality similar to what we see on the Samsung Galaxy A7 2018. This set-up is said to include Standard, Wide-Angle, and Telephoto lenses giving the S10 and S10+ great versatility as cameraphones. 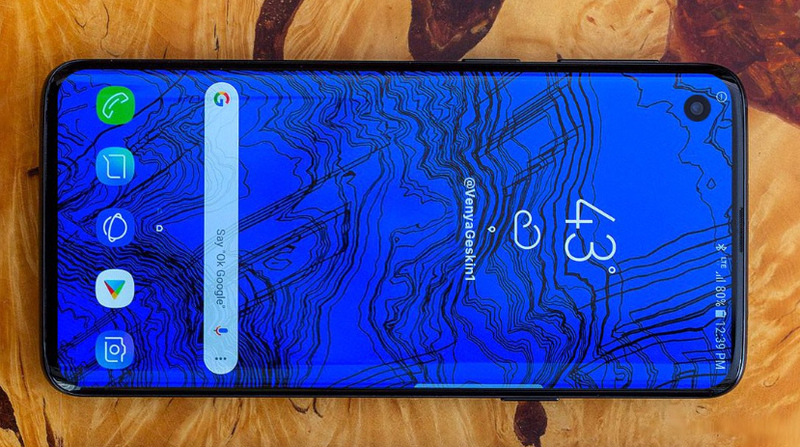 Fourth, Evan added that the Samsung Galaxy S10 will debut the all new "One UI" skin for the Android 9.0 Pie operating system; This will be the latest version of the company's own user interface for Google's mobile OS and will incorporate new software features and innovations by Samsung. Previously, the company had used TouchWiz, Grace UX, and 'Samsung Experience' UI on top of Android. And finally, as expected, both Samsung Galaxy S10 and S10+ will almost certainly have top-notch internal hardware, headlined by the all-new Exynos 9820 processor with 8K video recording support, up to 8GB of RAM, and 512GB of internal storage. These innards will allow these 2019 flagship models to deliver the smoothest and most enjoyable overall mobile experience to consumers be it while playing the most resource intensive games or while creating ultra-high-resolution video content. 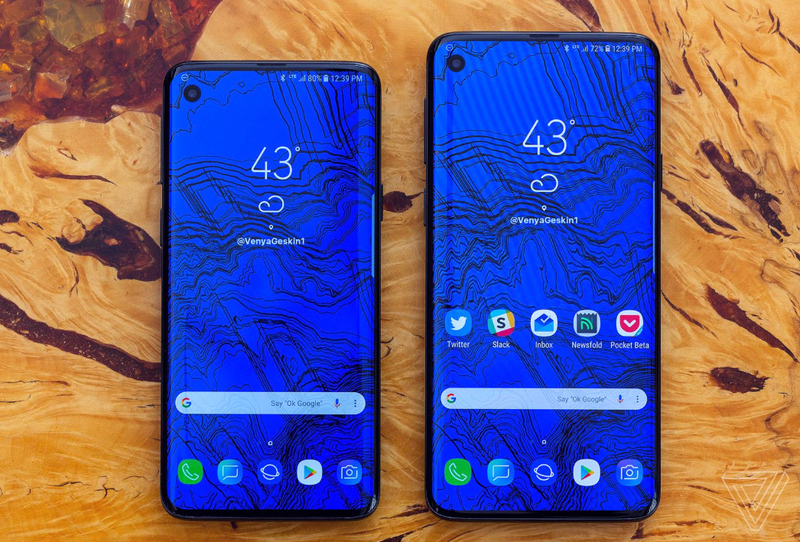 As for pricing and release date, I am expecting the "Samsung Galaxy S10" to don an official suggested retail price starting at roughly PHP 50,000 when it gets launched locally at the tail-end of Q1 next year or around the last week of March 2019.